A commuter train struck and gravely injured a 57-year-old disabled woman Wednesday after her wheelchair apparently got stuck on a stretch of railway near Old Town. 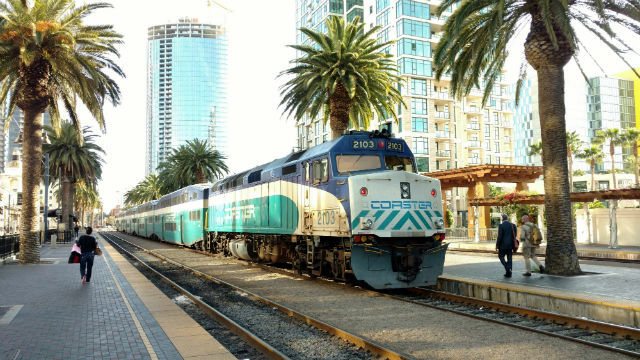 The southbound Coaster train was traveling at about 50 mph when the engineer saw the pedestrian in its path in the area of Pacific Highway and West Washington Street about 7:30 a.m., according to San Diego Sheriff‘s officials. Medics took her to UCSD Medical Center for treatment of life-threatening trauma, the sergeant said. Her name was not released. A witness told Fox5 the woman had been trying to cross the tracks when her wheelchair seemingly got stuck as the passenger train approached. The crash halted train service in the area for about two hours.